Legislation in Sacramento would pave the way for hiring 7,000 medical interpreters statewide to help non-English speakers. But does it go far enough? 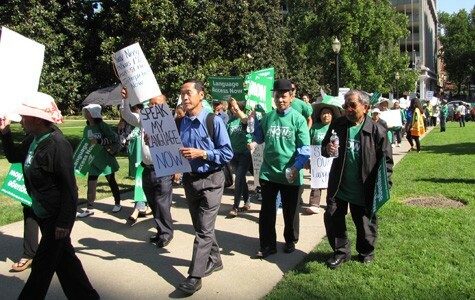 Activists have been demonstrating in Sacramento for better medical-interpreter services. Gloria Estela Ortiz Ramos doesn't speak English, so when she became ill in 2006 and needed medical care, she had to rely on her ten-year-old son for help. He translated a list of medication prescribed to her from the Eastmont Wellness Center, an East Oakland clinic that serves low-income people. But the El Salvadoran immigrant said she expressed concerns to her medical provider, because her son had just started to learn English himself. "There was a video interpreter present when I requested the instructions in Spanish, but it didn't really change the interaction — the doctor would still say, 'We don't have these in your language,'" Ramos told me through Jose Uribe, who works for Interpreting for California, a nonprofit dedicated to improving communication between medical providers and patients. Medical providers in California, like the one at Eastmont Wellness Center, often provide interpretation services via video-conferencing or phone — or sometimes not at all — a practice that can heighten the risk of miscommunication. Ramos decided to leave Eastmont for La Clinica de la Raza, a medical clinic in the Fruitvale district, where her current doctor is fluent in Spanish and her medication labels are translated, too. But she said she still suffers from problems associated with being over-medicated for too long, including chronic pain, poor circulation, severe headaches, and muscular degeneration — symptoms she never experienced before the start of her care. "I've been on varying doses of pain medications for months," Ramos said. "My condition has worsened since taking these medications at the start of my treatment." Under Title VI of the federal Civil Rights Act, patients like Ramos who are not fluent in English are supposed to have access to qualified interpreters. And in a diverse state like California, the number of non-English speakers is substantial. According to US Census data from 2010, nearly 20 percent of California residents over the age of five reported that they speak English "less than very well." In addition, about 281,000 low-income patients in the state's Medi-Cal program said they had difficulty understanding their medical practioners, while 135,000 parents of children in the program reported having the same problem, according to state officials. Yet in California, the medical interpreting system is disorganized and mismanaged, forcing many patients to rely on friends and family to translate when they require medical attention, thereby increasing the chances for misdiagnosis, injury, and unequal standards of care. A bill — AB 1263, which is sponsored by Assembly Speaker John Pérez of Los Angeles, and is awaiting approval this week in Sacramento — hopes to address these problems before the state's heath-care system becomes flooded with new patients when the federal Affordable Care Act takes effect in January. If enacted, AB 1263 would require the state to spend $1 million to $2 million on a statewide medical interpreter system in order to obtain nearly $270 million in federal funds from Obamacare. The legislation would create a state-certified Medi-Cal-patient-centered program known as CommuniCal. The state's Department of Health Care Services would oversee CommuniCal; would develop, monitor, and evaluate interpreter qualifications; and would develop its own training and certification programs. California, as a result, would join states such as Washington, Iowa, Indiana, and Oregon that already have their own state-based interpreter standards. It's expected that CommuniCal would add nearly 7,000 interpreters statewide during the next decade. Elizabeth Milos, a medical interpreter at UC San Francisco, said that medical interpreting requires a higher degree of concentration than most realize. Simply translating verbatim what a provider and a patient say can lead to serious problems. "You have to be self-monitoring and listening for precision and potential gaps for misunderstanding, whether linguistically or due to cultural or religious issues," Milos said. Furthermore, trained medical interpreters are taught to be aware of potential red flags during a conversation between doctor and patient, such as confusion over unfamiliar dosage measurements on prescription medication. The only official opposition to Assembly Bill 1263 is from a conservative, anti-union group known as the National Right to Work Committee, which objects to a provision that would allow CommuniCal interpreters, who will be independent contractors, to unionize. And while many medical interpreters throughout California say the state's system is broken and that they support AB 1263, they also have concerns that the legislation might produce some unintended consequences. For example, if the bill were to become law, some hospitals might lay off the well-trained interpreters they already have on staff and replace them with independent contractors from the CommuniCal pool. Milos' colleague at UCSF, Suzanna Reiss-Koncar, also is concerned that AB 1263 could result in medical facilities using more video-conference interpreting out of convenience rather than employing in-house interpreters who would meet directly with patients. Phone and video interpreting is "inferior to face to face, perhaps a little faster and more convenient in terms of time, but to the detriment and at the expense of the health of patients," she said. "This is absolutely clear." Don Schinske, executive director of the nonprofit California Healthcare Interpreting Association, also said he's concerned that medical facilities that already provide quality in-house medical interpreting will have no need to keep doing so — since all of their Medi-Cal patients who need interpreting services will be served by CommuniCal contractors. As a result, it might not make sense for hospitals to have dual services — CommuniCal interpreters for Medi-Cal patients and in-house interpreters for everyone else, Schinske said. "The solution proposed would work best if it was starting with a kind of blank piece of paper," he said. "The fact of the matter is we're not, and while we can say right now [that] overall there isn't enough language access provided and there isn't enough money dedicated to providing language assistance in the system ... on some level the trick with this bill is going to be can we possibly interlay that with what's already being done — and in some cases pretty well?" 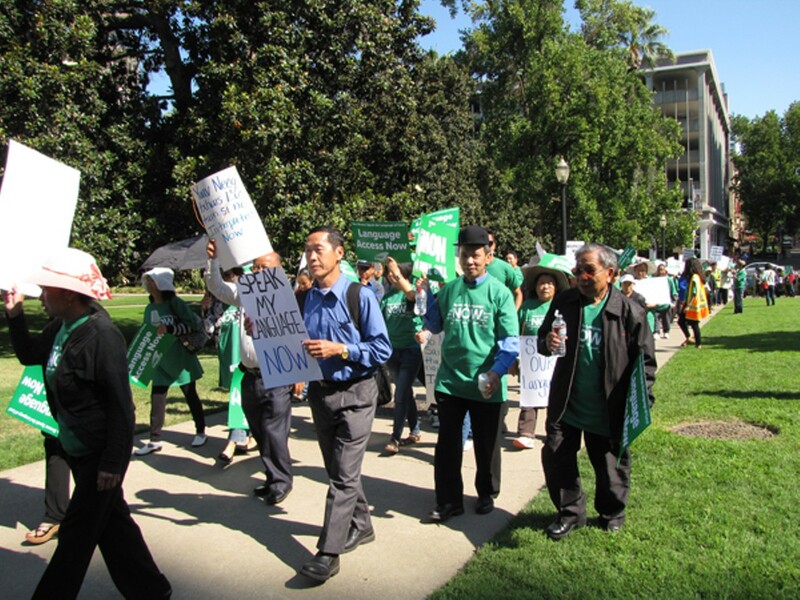 Pérez's office did not respond to questions about the possible consequences of AB 1263. It's also unclear whether the bill would increase awareness of patients' rights to a medical interpreter. California Health and Safety Codes mandate that general acute care hospitals provide language assistance to non-English speaking groups that make up 5 percent or more of the area served by the hospital, in addition to providing notices about interpreter availability, the procedure for obtaining an interpreter, and how a patient can file a complaint with the state over inadequate care. But hanging signs throughout a hospital isn't enough, Reiss-Koncar said. "A lot of people, especially immigrants, they have a different standard of politeness, a different standard of entitlement, and they aren't going to insist and speak up because they're grateful to just be getting care," she said. "People come from cultures where doctors are seen as being above them. To come from poverty and a place where they're low on the social hierarchy, they're not going to question their health care professional, much less complain, and they don't want trouble." The recent purchase of 20,000 acres of coastal redwoods could become a prototype for sustainable lumber harvesting.